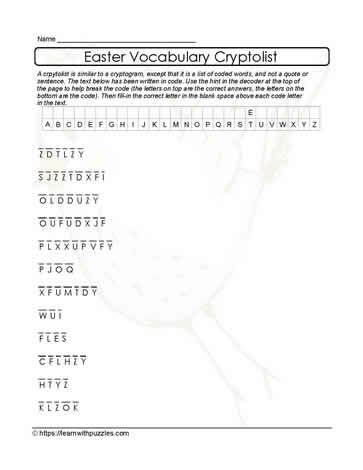 This Easter vocabulary cryptolist printable puzzle great family fun and supports vocabulary building, problem solving strategies. Decipher the alphabet code used to encrypt the list of Easter words and record the letter substitutions in the chart at the top of the puzzle. Tutoring resources, homeschooling, classrooms for students in grades 3,4,5. Use DI to support struggling readers and ELLs in the classroom.